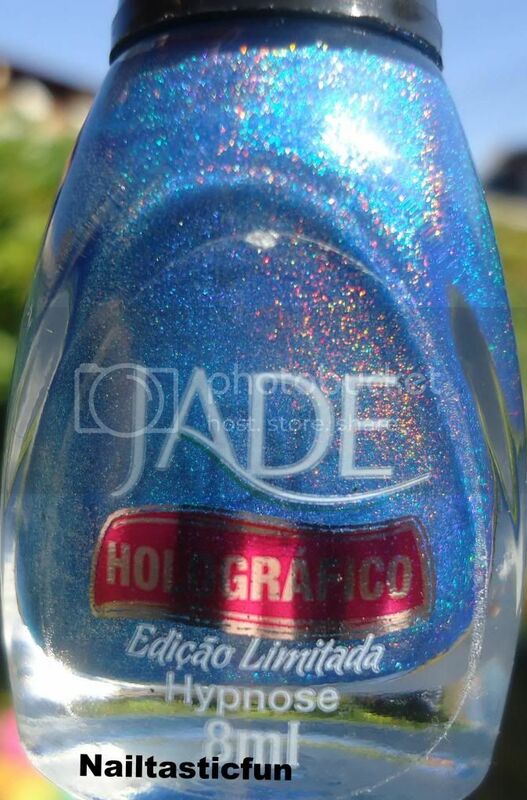 JADE "Hypnose": from their "Holografico" collection, I did first apply my NFU-OH aqua base ,(a base specifically for holo polishes) as I always do, so I had no balding issues. But I have heard from most, that after a few coats, balding is not an issue with this brand. 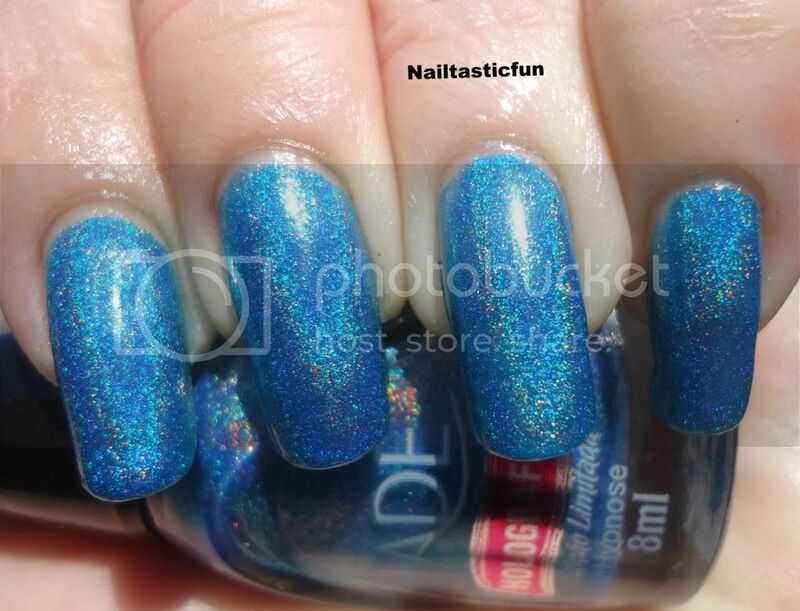 I put on 3 coats and then a top coat. 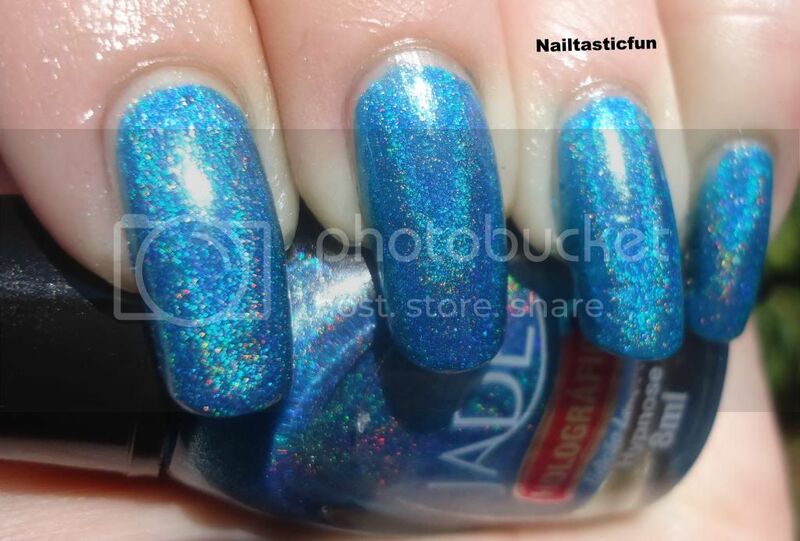 I am always not sure if I should add one when it comes to holo's. 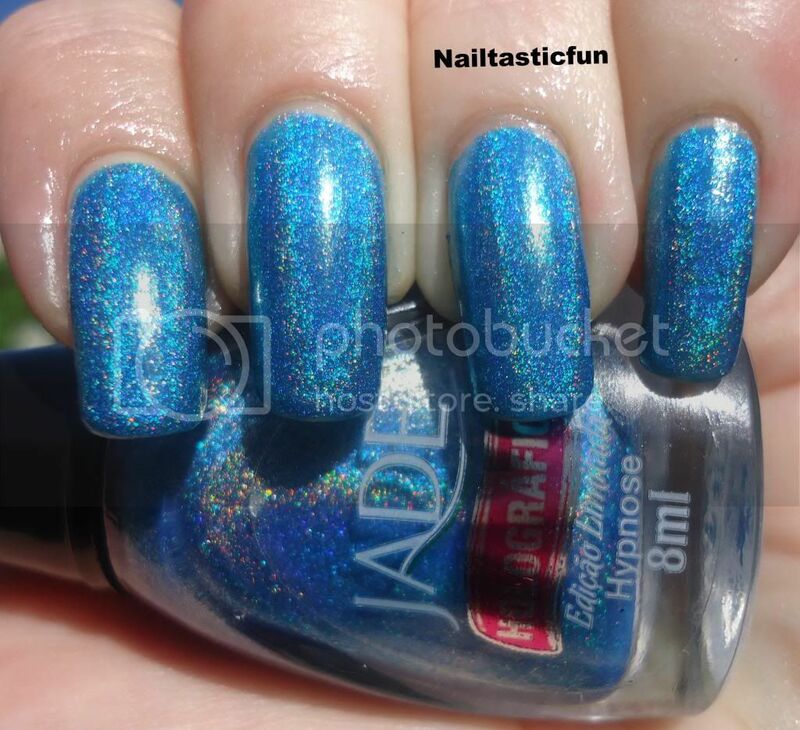 Some say "yes" some say "no" but it really depends on the polish/brand. 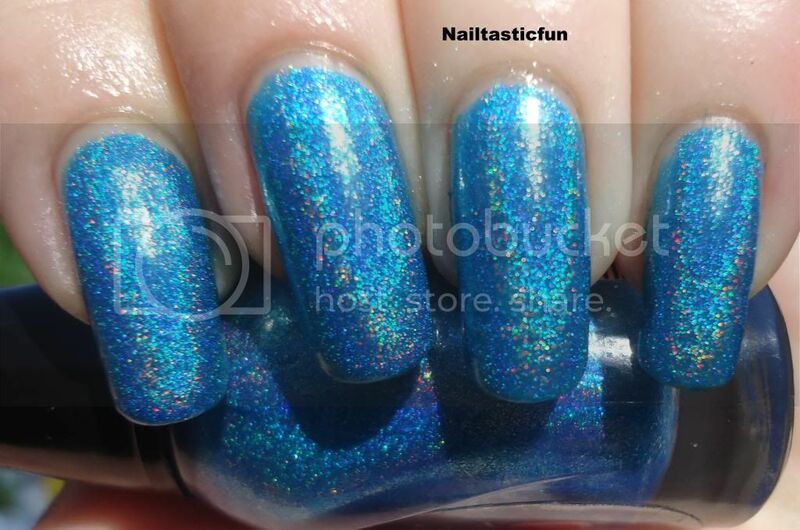 In the case of some holo's, a top coat may take away the holo effect of the polish and make it dull. 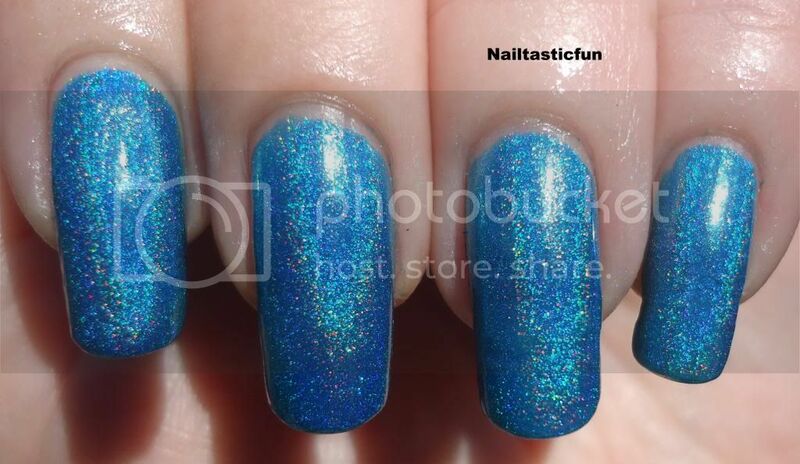 So, I asked around in my nail groups for opinions, and the popular vote (more than popular, almost all agreed) that when it comes to Jade holo's, add a top coat and it does not affect the look. 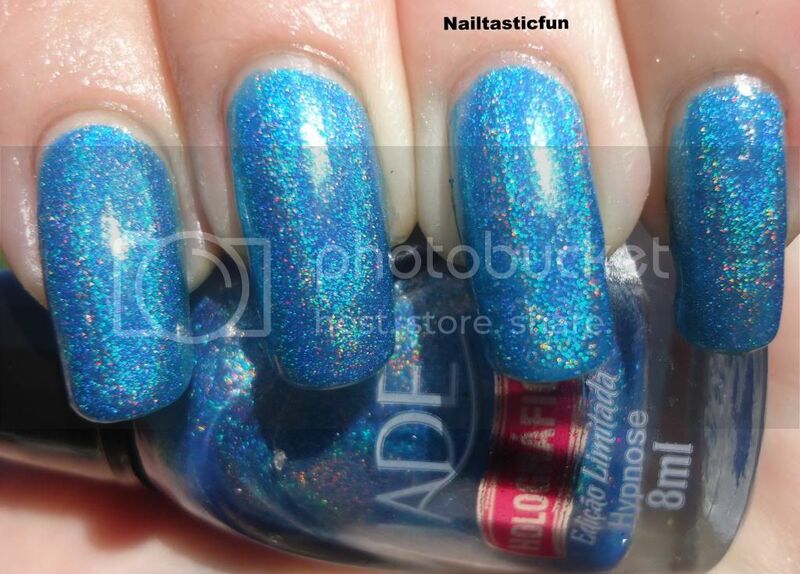 If, you add a top coat and you feel that it made it look dull, you can always add one last coat over the top coat. 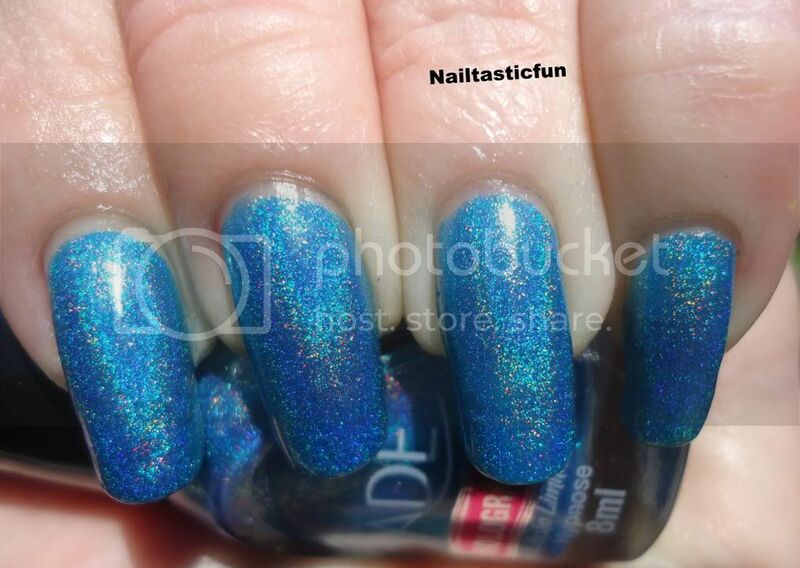 This is what I do with other holo's that do suffer dullness when a top coat is added. 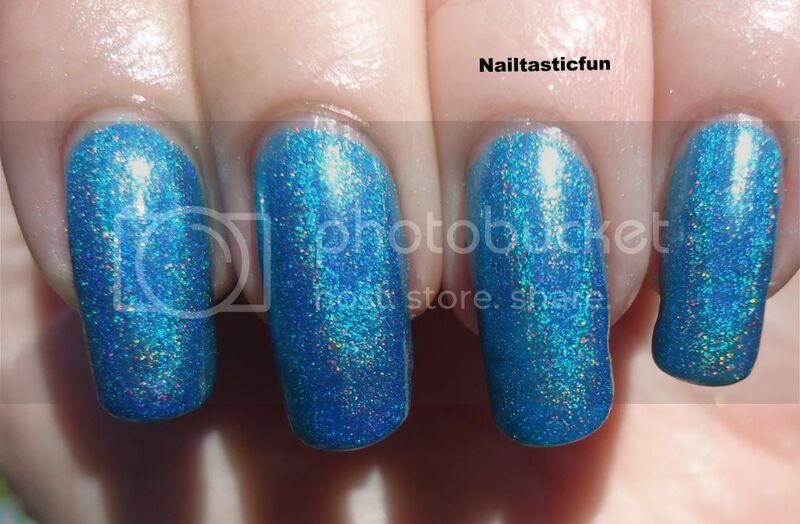 But, for me, 3 coats then a top coat and all was fine:) As for description of this polish (sorry, I got a bit off track here).... "HYPNOSE" is a gorgeous electric, blue polish, full of holo goodness!!! 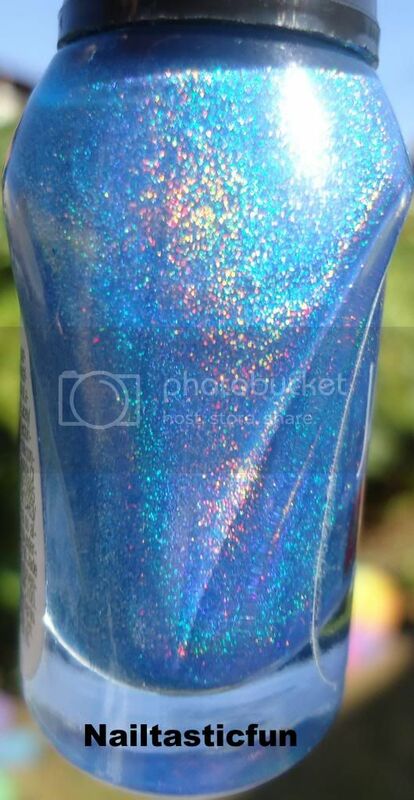 Just look at this gorgeous holo!!! Look at it in the sun!!! Do you see that Rainbow flair?? 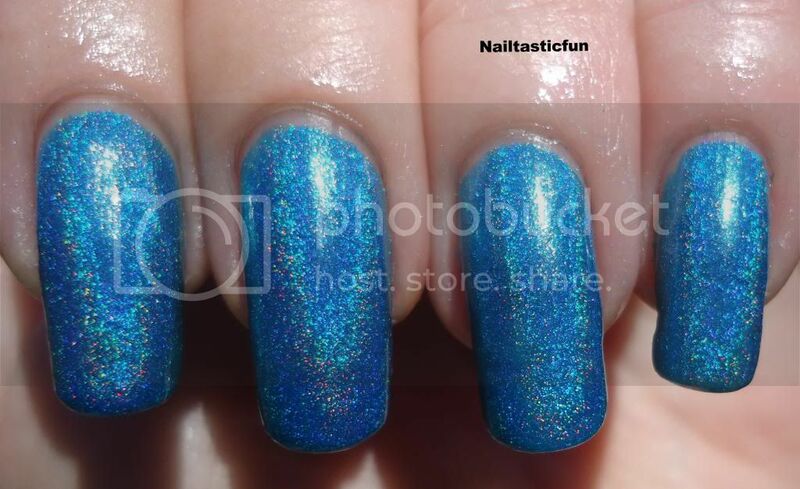 See what I mean when I say holo's come to life under the sun? 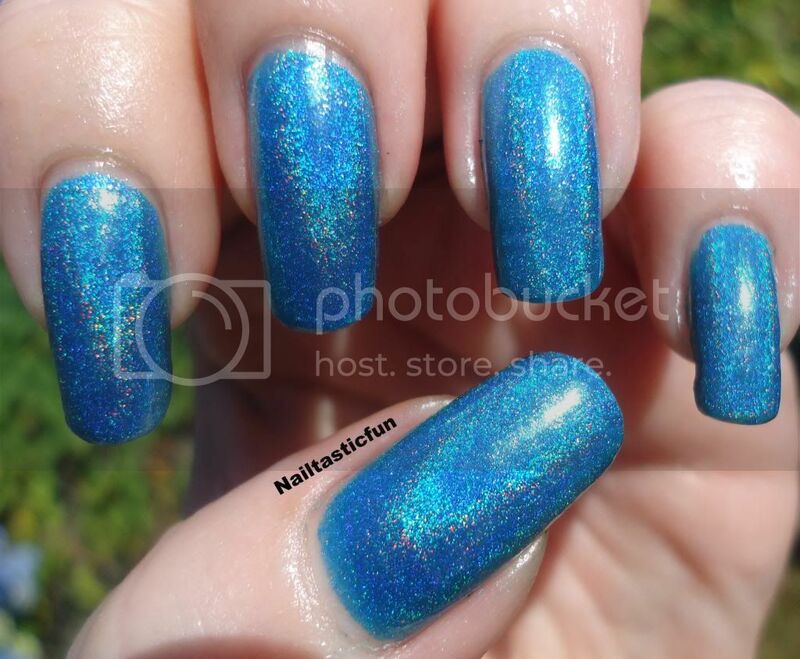 When in the sun, you can see that "rainbow flair" which is, as you can see at the bottom of my nails, how the color kind of has a "rainbow" affect...see it? 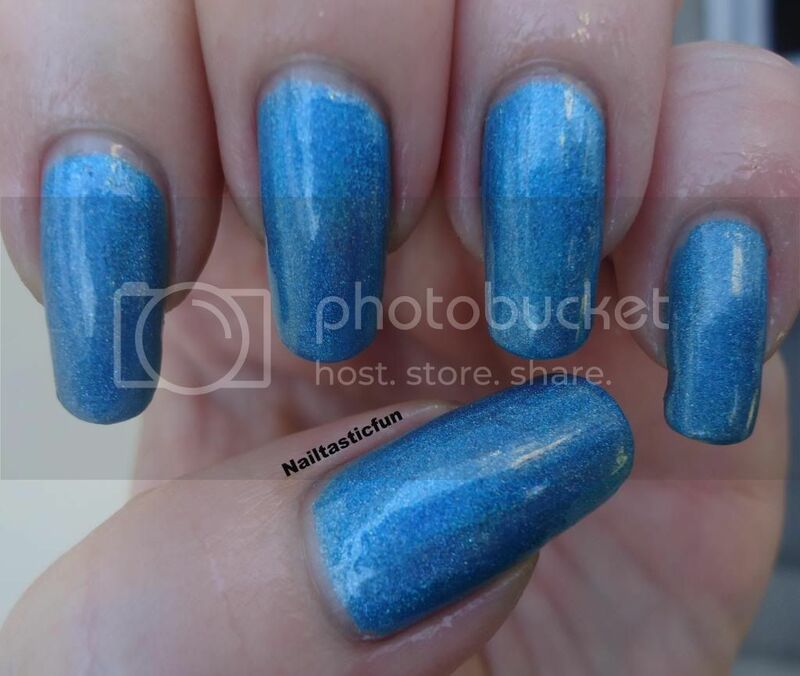 I just LOVE this blue! LOOK AT IT!!! IS it not gorgeous?? 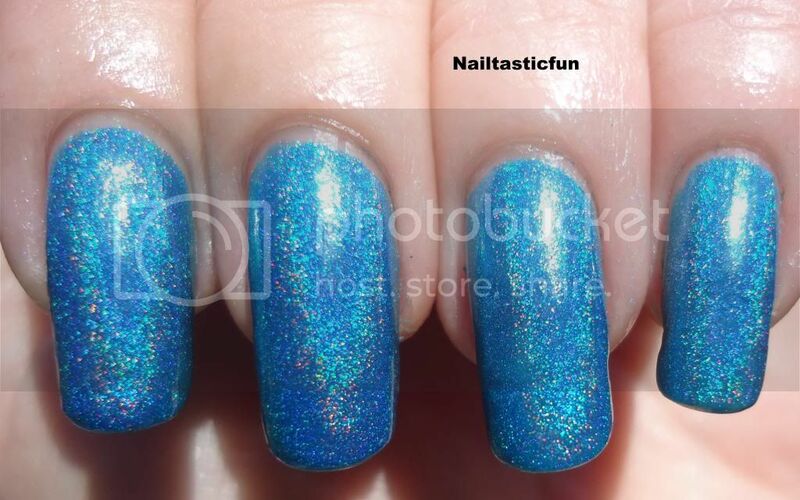 It can't just be me who thinks this is a gorgeous holo, right?? SO GORGEOUS!!! Can't say it enough!!!! *these polishes were given to me in a swap. 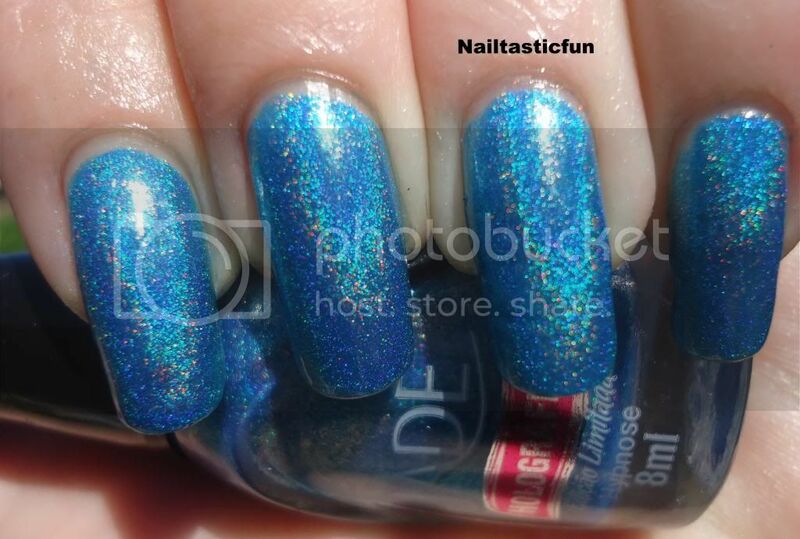 It was on my wishlist, and I did a swap with someone for some random polishes. They see what I like, I see what they like and we go from there. Seeing as this was on my Wishlist, my partner chose to give it to me as part of our swap. I sent her polishes in return. 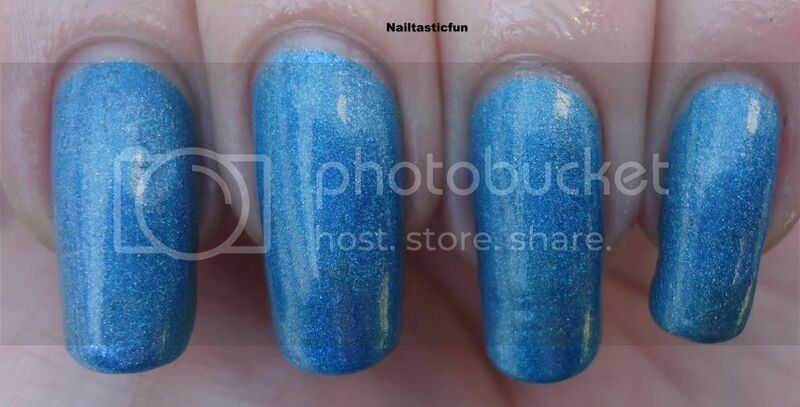 So, it was not purchased with my own money but it was part of a swap and all opinions expressed in this post are my own from my experience with this polish. IT was new and never used.